The ‘in between’ is the and place of the ‘portal intellectual’/ the ‘studio’ intellectual….still struggling here….makes a difference! Heidegger, chapter four, History of the Concept of Time (summer 1925) “A More Original Explication of In-Being: The Being of Dasein as Care,” reminds us that the project is one of moving beyond the metaphysics issuing from the ‘subject’ [nb: understood in the wake of Heidegger, post-structuralism and deconstruction are post-metaphysics but properly described as ‘post-subjective’ which is the real meaning of the term ‘post-modern’ as in post-Cartesian]. Heidegger writes: “we could say then that the being of Dasein is precisely the being of the ‘between’ subject and world. This ‘between,’ which of course does not first arise by having a subject meet with a world, is the Dasein itself, but once again not as a property of a subject. This is the very reason why, strictly speaking, Dasein cannot be taken as a ‘between,’ since the talk of a ‘between’ subject and world always already presupposes that two entities are given between which there is supposed to be a relation. In-being is not a ‘between’ of real entities but the being of Dasein itself, to which a world belong at any given time and which for the time being is mine, and first and foremost is the Anyone.”(251-252) Describing or identifying ‘between’ as the being Dasein itself is significant for this project, and, perhaps, an analysis of the fourth chapter is required. For now, let the statement suffice on its own in relation to something Heidegger said twelve years later, in academic year 1937-38, published under the title Basic Questions of Philosophy. The section that is of most relevance for this project is chapter five, “The Need and the Necessity of the First Beginning, and the Need and the Necessity of an Other Way to Question and to Begin.” Now, it is obvious that this chapter is related to the problem of working out an ‘originary/original’ philosophy of education. Here, what is especially important is that Heidegger speaks of “the need” and “the necessity” and repeats this twice. This should not be overlooked. So we have this ‘need’ and ‘necessity’ and the whole complex problem of ‘writing,’ actually, which emerges within this fifth chapter in section: “The danger of disturbing the basic disposition of wonder in carrying it out. [techne] as the ground for the transformation of [aleithea] into [????]. The loss of the basic disposition and the absence of the original need and necessity.” Here the problem is the caution of what I would call ‘domesticating’ the basic disposition of wonder that arises out the distress of not knowing the way out. Writing itself, i.e., the practice of translating thinking into communicable ‘text’ that can mediate the work of the collectivity, that enables us to read and discuss, becomes a problem of always being precariously close to the danger of domestication, or of becoming caught up in the logic of knowledge consumption. Of this danger: “There lies the possibility of arbitrariness, of an unbridled position of goals and thereby of the possibility of escape out of the necessity of the primordial need. If this happens, then in the place of the basic disposition of wonder, the avidity of learning and calculation enters in. Philosophy itself then becomes one institution among others, it becomes subjected to a goal, which is the more insidious the higher it is – e.g., Plato’s [paidea], a word we badly translate as ‘education.’” (155-156) The force of the last part of this statement is overwhelming, and really is the culmination of what must be said before. Suffice it here to say that the problem of remaining ‘in’ the distress of not knowing, and with the basic disposition of wonder, is the problem of the border/threshold/studio intellectual, and it is the challenge of remaining ‘in’ study, or ‘in between’ past and future, before education. For 32 years, Maxine McClintock has taught history to students in public and private high schools and college, most recently from 1990 to 2006 to juniors and seniors at the Trinity School in New York City. Currently, she is taking a year to write about teaching and teachers. Her Ph.D. (1986) was from Columbia University and her dissertation was on the sense of possibility in the work of the Austrian novelist, Robert Musil. I first read Jacques Barzun’s Teacher in America thirty-three years ago. It inspired me to believe that teaching was an art through which the young could develop sympathy of mind, integrity, and respect for what is difficult. Barzun — witty, clear, and level-headed — discussed the working conditions I would encounter in the effort. Now, battle-tested, having lost my innocence about teaching, I picked up Teacher in America again and wondered whether it could still inspire teachers to practice their art. Admittedly, I had my doubts. Over 60 years had past since Barzun wrote the book. Digital technologies, multiculturalism, equity, high stakes testing, vouchers, charter schools, curricular standards, and accountability dominate the educational vernacular. All along, professors of education had treated Teacher in America as a heretical text and had rarely recommended it in their courses. Despite all these changes, and the cold shoulder, Teacher in America has consistently had a public readership. Buoyed by memories of its inspiring effect on me, I began re-reading. I hoped the experience would not be like spotting your high school sweetheart at a reunion and feeling overcome with surprise and revulsion for the changes time had wrought. To re-read Teacher in America, I first considered its historical context. Barzun wrote the book in 1945 as the nation turned to rebuild a “democratic, capitalist consensus.” As a leading historian now describes it, “all Americans except the maladjusted and fanatics shared the same liberal values of individualism, respect for private property, and belief in equal opportunity. If problems remained, their solutions required technical adjustments, not structural change or aggressive political intervention.” The nation’s political, economic and intellectual elites desired consensus. To gain it, they enacted a tacit social contract: the elites would insure that America’s post war abundance was widely shared, while the populace would abandon the political activism rife in the Depression era. Consensus would cede authority to the elites, who would implement the good of the commonweal with the help of technocrats and bureaucrats. Consensus thinking also influenced the schools and the instruction the baby boomers received. Philip Roth’s novel, The Human Stain, vividly depicts consensus expectations about post-war schooling. Ernestine, a black, retired, school teacher articulates these expectations to the narrator, Nathan Zuckerman. “In my childhood, as in yours, it was recommended that each student who graduated from high school in New Jersey get at graduation two things: a diploma and a copy of the Constitution. Do you recall that? You had to take a year of American history and a semester of economics as, of course, you have to no longer: ‘have to‘ is just gone out of the curriculum.” Ernestine’s graduation copy of the Constitution represented consensus thinking in education, the common body of knowledge professional educators and the public expected every high school graduate to know. Ernestine, and her fellow graduates, assumed that possessing this knowledge would certify them as productive and upstanding citizens — persons who value individualism, respect private property, and believe in equal opportunity. Public support of this civic identity made the roles of school and teacher clear. Schools conserved the common knowledge needed to sustain consensus thinking; teachers disseminated and evaluated their students’ proficiency in learning it. Recalling their schooling, many baby boomers remember with nostalgia the influence consensus thinking had. They credit it with making public education work. Back then, it seemed that only the wealthy or malcontented would attend a school other than the local public one. The playa at sunset. Photo by Kevin Tang. 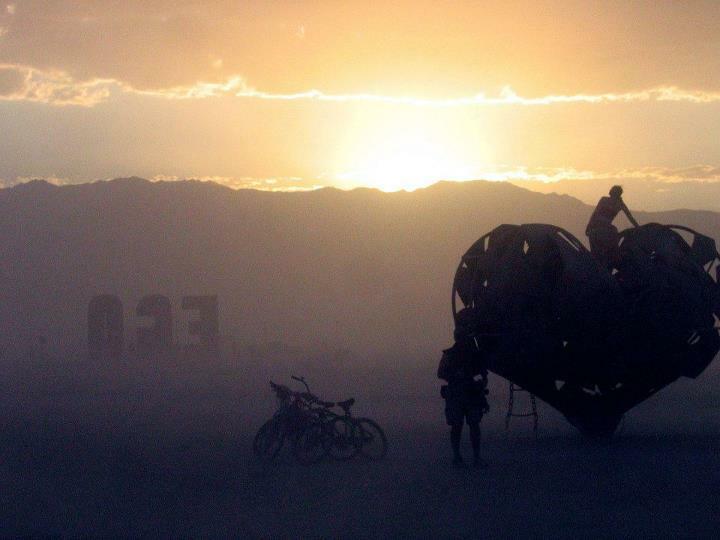 Such was our introduction to the gift economy of Burning Man. Describing the event to the uninitiated is a challenge. Burning Man is weird, and not only in the countercultural, body-paint-and-naked-cartwheels kind of way. The principles that it aspires toward–and, to an impressive extent, succeeds at enacting–are ones that you rarely see embodied in such an enormous form. Every year, 50,000+ people gather in northwestern Nevada on a stretch of desert so bleak that it is literally free of indigenous plant and animal life (save, I’ve read, some microscopic shrimp that appear from somewhere during flash floods). For roughly a week around Labor Day, this pop-up community is home to art on a massive scale, to all night dance parties, and to a functioning gift economy. With the exceptions of ice and coffee, nothing is bought or sold during your week on the playa. Even barter is considered gauche. Instead, gifts of food, drink, art, hugs, etc. are given freely. On Saturday night, the eponymous Man burns and then on Sunday, the Temple–an architectural marvel that would be on postcards were it located in a permanent city–goes up in smoke. I took my boys to see Ice Age 4: Continental Drift today. My boys adore Scrat, the squirrel-like subplot character who consumes the whole series chasing after acorns. It’s fascinating really, to watch the predictable plot plodding along with most adults thinking that it’s the focus of the story, whilst a 4 and 6 year old recognize that Scrat is the only thing worth remembering and paying attention to. The good, old-fashioned slapstick of Scrat trumps the soft, sugary, politically/scientifically correct, Land Before Time-esque sentimentalism of Diego, Manny, and Sid. I consider this series a stroke of subplot genius in that respect and my children seem to agree, in their own absurd and childish way—which, of course, is the point. This time around there was more than just Scrat to pay attention to. The feature film opens with a silent short, a reprise of The Simpsons franchise. I was never allowed to watch The Simpsons when I was young, but I have heard from credible sources that it is fantastic. I may now stop dismissing that view. In his latest, Derridian post, Professor Iguana interprets Derrida as saying “that we should ‘say everything’ even if it is experimental performance, or a work of ‘fiction’—and this ‘even’ is not an aside but feels like an imperative or a challenge to do the work in this way…” I think that Prof. Iguana’s insight is both true and directly applicable to education questions. For one, we see an inversion of the truth of Iguana’s passage in present-day schooling, in their policies and curricula. To riff somewhat playfully on Iguana: we are to say nothing unless it is precisely NOT an experimental performance or a work of fiction—and this ‘unless’ is not an aside but an imperative to do the work in this, and only this, way. The modern University is emulated in all the “lower” mini-university institutions and they all share and serve the same god: Science. In fact, science itself has devolved into thinking of itself as a science. The art of science—the process of saying everything, even through performance and fiction—has been replaced by a strange, incestuous idol: the science of science. As a result, teaching is thought to be a science. Everything is thought to be a candidate for science. It is either available to science or it is nothing at all. Since modern science has created a metaphysical, existential confusion, a phenomenological confusion about what things are, it is no surprise that education is often (mis)understood and measured in terms of its production of science and its progeny, technology. This begs the question: does education really need science to survive? Can education be attained without modern science as its means and its end? Is “education” possible beyond the servitude of science? After reading Derrida’s ‘The University Without Conditon,’ I started doing something like a genealogy of academic freedom, trying to think about how that mostly forgotten beginning in Bologna has some possibly implications for the way that we think about our work in the academy today. I’m sharing some of that writing in its raw form here in Formative Justice. Aside from the potential for misunderstanding whom the dispensation applies too – that is, a misunderstanding that would believe the Habita is only applicable to the faculty of theology, when, in fact, the university of Bologna was grounded in the study of Roman/Imperial/Justinian law, and thus it must be assumed that in granting this privilege, Barbarossa was, in effect, legitimizing his claim to the status of Emperor — the presentation of the Habita [perhaps following the example offered by Agamben] is intended to be part of a recollection of the covenant that establishes the dispensation of the university, specifically, the students and faculty, from the limits of their speech by local authority, with the deconstructive move being the exercise of this right in the form of a performative work that appears as an ‘internal critique’ of the university, as testing of faith in the Habita. This is where the role or identity of the critical educational theorist emerges as one who ‘tests’ or ‘examines’ the university’s ‘tolerance’ for academic freedom. Further reflections on the Authentica Habita of are important, and should be linked, both in content and form to Agamben’s work on sovereignty. The continuity between the Jusitinian Codex, the extant body of Roman law at the time, is crucial, as noted above, insofar as it seems to be a clear attempt by Barabarossa to legitimize his claim to the title of Emperor by not only placing himself above the local authorities as the ultimate authority, but also insinuating (?) 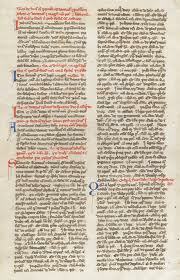 himself into what had become the principal source of study, namely, that very same Justinian Codex. Of course, this served the students and faculty in two important ways. As [citation] has noted, the original faculty at Bologna were living within a paradox: their study of the Codex was, from the standing of the Codex itself, illegitimate, because Justinian had identified [specific] locations as the only legitimate and authentic study of the law: Rome, Constantinople, and…. But this paradox experienced by the original Bologna faculty was, of course, resolved by a fiction issued by Thesodorius. So the Authentica Habita served the needs of the faculty and students of Bologna insofar as it now appeared to authentically legitimate their study of the Codex, which, by then, had already become an established practice. Now there is the metaphoric sense of ‘exile’ that builds upon the imagined ‘as if’ of the legitimacy of the practice of studying the Justinian Codex, and, for me, the force of Derrida’s invitation that we should ‘say everything’ even if it is experimental performance, or a work of ‘fiction’ – and this ‘even’ is not an aside but feels like an imperative or a challenge to do the work in this way – is made stronger, or is generated by, or generates more power when we make the following reading of the beginning of the universitatis: it is ‘conceived’ via imagination [I hesitate to use the word ‘contrived’]. [although ‘contrive’ does have a primary denotation that does not carrying the full weight of the pejorative: to plan with ingenuity, to devise, to invent. Moreover, the lingering sense of ‘manipulation’ or ‘scheming’ doesn’t seem to me a problem, and, in fact, gives this origin a kind of intrigue (? ), or makes it human, and points toward an less than ideal beginning, or one that does not seek to be apocryphal, but is the self-conscious product of designing and building, of making a location, of claiming a place. Of course, when written in this way, it does come across as bearing the quality and characteristic of a kind of colonial logic….] And because of this beginning the original faculty established “the study of letters” as that exact kind of theoretical work that we might describe as the performance of the oeuvre, the singular work that occupies its own space (understood from a phenomenological and ontological perspective), and in occupying this space is not by intent linked to anything beyond itself. It is ‘self-referential’ in some regards, but in sense it is like the dialogue of thinking: eme emauto, a silent dialogue between the self, the meditation.